So why spend years writing a novel like Mama Namibia and doing a Facebook blog about a genocide that happened more than a century ago? First of all, the 1904 genocide in what was then German South-West Africa is not ancient history. Its victims were the parents and grandparents of people who are alive today. The consequences of that genocide continue to haunt the descendants, impacting their daily lives economically and emotionally. The extermination of 85 percent of the Herero and half the Nama made them a minority in the country that was to become Namibia. While they have a small voice in the government today, their communities often get the short end of government spending on schools, roads, and other improvement projects so desperately needed for economic growth. Some of them still live in exile in Botswana and Angola. Many of those who live in Namibia remain landless because the land of their ancestors was taken by others. 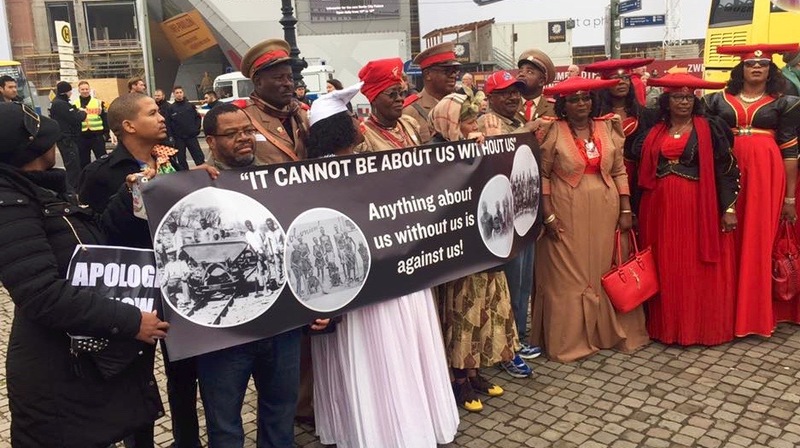 German officials continue to marginalize the descendants of the genocide survivors by refusing to meet with Herero and Nama leaders to discuss an official apology and meaningful reparations. Instead, they insist on negotiating only with Namibian officials who are from tribes not targeted by the genocide. And Germany has yet to make a comprehensive effort to find all the bones of Herero and Nama genocide victims that were taken there as souvenirs or for “scientific” research. While some skulls have been returned to Namibia, many more are packed away in German universities, museums, and, perhaps, attics. They need to be buried in the land of their ancestors. Secondly, the 1904 genocide provides context for other genocides. It shows that the Holocaust didn’t happen in a vacuum or at the whims of one monstrous man. It also highlights the need for other nations to stop a genocide in the making instead of waiting to punish the guilty years after thousands or millions of innocent people have been slaughtered. And it reveals that if a country doesn’t have to answer for its national crimes, it – and other countries – will repeat them. If genocide is to end, we all must become more aware of the past and of what’s happening in other parts of the world today. And we must not turn away. The danger is that with every genocide we deny or ignore, we grant permission for the next.